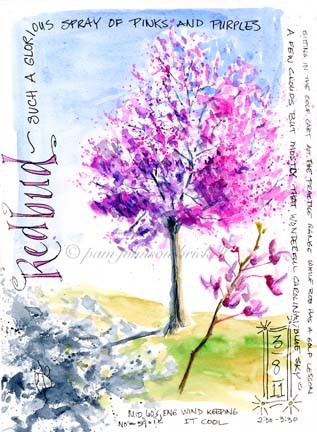 South Carolina LowCountry Nature Journaling and Art: Redbud! This little tree seems to light up for miles. It's perched on the hill beside the driving range in my neighborhood. I planned to include it in my initial Spring page in the previous post, but couldn't contain myself. This beauty needed a page of its own! Rob was having a golf lesson, I sat in the cart and did my favorite thing :) The entire page was created there. I checked the weather when we returned home. I thought it was at least in the mid 60's as I was in the sun and out of the wind....but not. Only 59 with a strong ENE wind. oh this is gorgeous. I didnt realize that redbuds were so pretty. I love pink trees. We have flowering plum trees starting to bloom all over town. Not as brilliant as this tho. YOu did a lovely job on this page. I can't wait until our redbuds are out. We have several weeks to go, yet, I think. I love it!! I envy your talent Pam. I really DO! Thanks, Chris. This was probably planted as a specimen tree. They do grow wild also. There's no mistaking them! Love your exuberant free hand sketches and writing!!! Another perfect harbinger of spring - redbuds! They color the hills all around northern KY - so fresh and pretty. You did a great job on this - I think your joy was showing throughout.